Raising your vibration, did you know if you can raise your vibration? The things that you want will come to you like a magnet, but the problem is society's energy is programming us negatively, so it becomes difficult to raise our energy for the level you need it to, to attract what you want. And in this video I'm going to share with you three hidden techniques for you to raise your energy so you can attract what you want. This is j.j.com. Let's dive right into this video. You must know what your vibration is first of all, and then you can learn how to actually upgrade it. What is feeling? Feeling is conscious awareness of the vibration that you're in. Now, what is vibration? The physical universe is made up of energy moving at a very high speed of vibration. To our limited physical senses, our eyes, the energy looks like it's a solid object, but it's really just moving at the speed of light. When scientists start breaking down, atoms, the building block particles of our universe, hey find is they're 95 percent empty space. It's nonphysical energy, non-physical consciousness or intelligence that is permeating, penetrating and filling the inner spaces of our universe. This energy all has different frequencies. Much like you turn the knob on the radio. Different stations are going to play different music. This whole reality is different vibrations. We're like those knobs not he radio. One person can be tuned to poverty and the other person can be tuned to attract money easily. You can feel the energy of a situation or an individual. What is that? It's your subconscious mind picking up on something or somebody else's energy field. When you understand this and you understand how to raise your own vibration, you can raise your vibration to the frequency of the things that you want and attract them into your life. The Law of Vibration says that everything is energy and energy is always moving and everything is vibrating at certain energy frequencies. The Law of Attraction is a primary law in the universe, but it's behind the law of vibration. The law of vibration is so, like I said, everything is energy. The law of attraction is telling us that different vibrations are responding to one another. Like energies, like vibrations, attract one another, so you can learn how to get your energy to a level where you can attract what you want easily and quickly. Feel what you want before you have it. When you learn how to shift your energy field to be in harmony with what you want, you win the game of life and it becomes very easy and very fluid to attract what you want in your life. The big shift in my life was when I was trying to build my career, doing what I'm doing and wanting to do this for a living. I wanted this life. It was my passion, my purpose. The problem was I wasn't making any money. My now wife was in debt. People around her were telling her to tell me to quit and get a job and stop doing it. She was in debt and I couldn't help her. I said, "I got to change this." Now I realize that your thoughts and your emotions and your unconscious belief systems create your overall energy field. I began hypnotizing myself for success and abundance on an unconscious level to tap into my unconscious energy field and shift it. The results were amazing. My YouTube channel took off. My online courses have now been viewed by countries all over the world and my life changed. If you want to use that, it's right there down below. 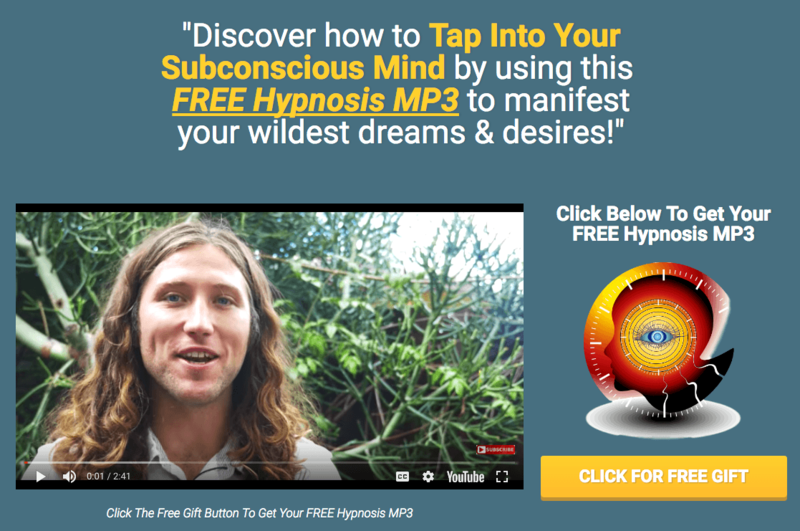 It's totally free and you can use that to retrain your subconscious mind. You're feeling about things creates your emotion. It creates your energy, emotion. What's your energy and motion? It's your vibration. It's your energy field that's going to dictate what you attract back into your life and that's going to control what you do and do not experience. How do I get aware of that? It all comes down to feeling. Can you feel what you want before you have it? You have to eliminate any negative thought processes all together and you got to realize that everything is energy. Your energy, your thoughts and your feelings control your destiny. Can you begin to feel optimistic about your life even if your life hasn't changed? You have to block out what your eyes and ears are telling you. My success hypnosis allowed me to do that that. That became my tool for me to start to develop my own train of thought and ultimately my own feelings because my feeling was what was going to shift my vibration and ultimately change the things that I was attracting into my life. I started telling myself all the time, I'm so grateful my YouTube videos are taking off and it wasn't just saying it. I was saying what would it feel like if I was truly successful on YouTube. I was overwhelmed with gratitude that my channel took off and there was beautiful people from all over the world just like you watching videos, commenting, sharing their wisdom and their knowledge with other people in the community and that it was this learning platform. I was having financial difficulties. Ashley was struggling but I was creating an inner feeling and ultimately that started shifting my energy field and then the results in my life started to change. Nobody can bring you down. Wayne Dyer said it best. He said that if other people are your problem, you have to send the whole world to the psychologist before you can ever get better. If you're reliant on something outside of yourself, then that thing will always control you and you can never change unless something outside of you changes, but you don't control other people. We must intend to feel good. Begin to focus on the possibilities rather than what's missing. You can never be a powerful creator if you're reacting to everything around you. There's things happening there, signs that you just might not be seeing. The universe might just be trying to teach you a powerful lesson. What if the universe is trying to give you a powerful lesson? You can say, I'm so grateful now that this is happening. I can feel the shift starting to occur and I'm so grateful for all the struggles that I've been having because it's a lot on me to go inward and reconnect to my own energy. Notice any negative thought patterns that in the past have held you back and now you're so grateful because you're free from those thought patterns. I still notice them and I still have them, but they don't control me anywhere. They're just like the wind blowing in the breeze and I feel inspired. Creative. I know powerful people are heading in my direction and this week's going to be fantastic. I just know this can be the best week I ever had. I am right on the cusp of a breakthrough. I'm going to keep working hard. I'm going to keep showing up. Make sure that you download my free success hypnosis below. You've got to get rid of beliefs from your parents, the media, from teachers, from other classmates growing up, from other adult figures. Negative promos are not allowing us to attract the success that you deserve. Today's going to be a fabulous day. Something fantastic is going to happen today. Keep that energy up and something great is headed your way.